It's been a week of rather important political speeches. Some quotes. "People the world over have always been more impressed by the power of our example than by the example of our power." Clinton's speech had a lot of finger wagging, but it's been a while since I've seen him, and now I recall why they said he was such a good orator. "And Barack stood up that day, and he spoke words that have stayed with me ever since. He talked about the world as it is and the world as it should be. And he said that all too often we accept the distance between the two, and we settle for the world as it is..."
Well done speech, but nothing amazing. She didn't come off as arrogant and so it was considered a political win. This part, though, reminded me a lot of kingdom theology, "now and not yet." "John McCain likes to say that he'll follow bin Laden to the Gates of Hell - but he won't even go to the cave where he lives." ~ Barack Obama, DNC speech (transcript). Come on, Barack. It's more complicated than that and you know it. Cheap shot. "Well, it's always, though, safer in politics to avoid risk, to just kind of go along with the status quo. But I didn't get into government to do the safe and easy things. A ship in harbor is safe, but that's not why the ship is built. Politics isn't just a game of competing interests and clashing parties. The people of America expect us to seek public office and to serve for the right reasons." 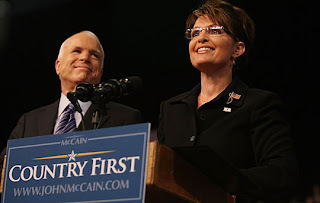 ~ Sarah Palin, acceptance speech as John McCain's Vice-Presidential pick (transcript). She's the new, most interesting one of the bunch. I assumed McCain wouldn't nominate an "old white guy." He needed to be able to take away the idea that voting Democratic was the only historic option. I'll be curious to watch this woman futher. She's definitely vulnerable to the experience attack... even more than Obama.